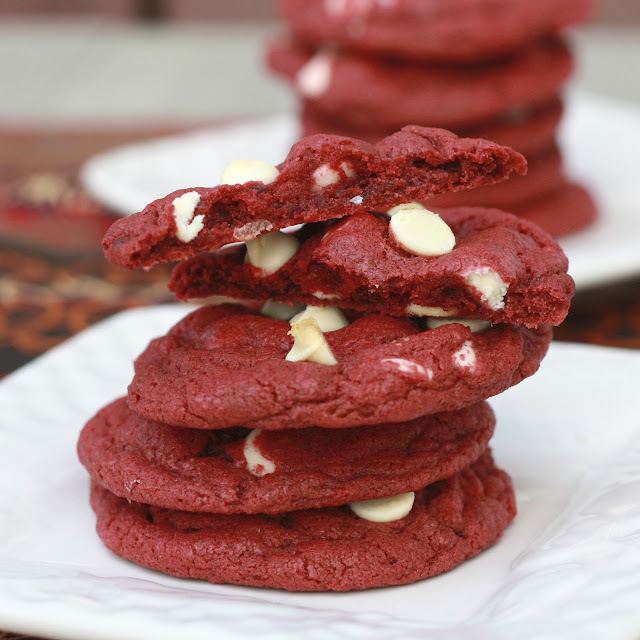 Can you get past the idea of red velvet without cream cheese frosting? You must. You will, after you try these. Like you, my favorite part of red velvet cake is always the frosting but there’s no cream cheese or frosting in this recipe. You’ll survive, really! 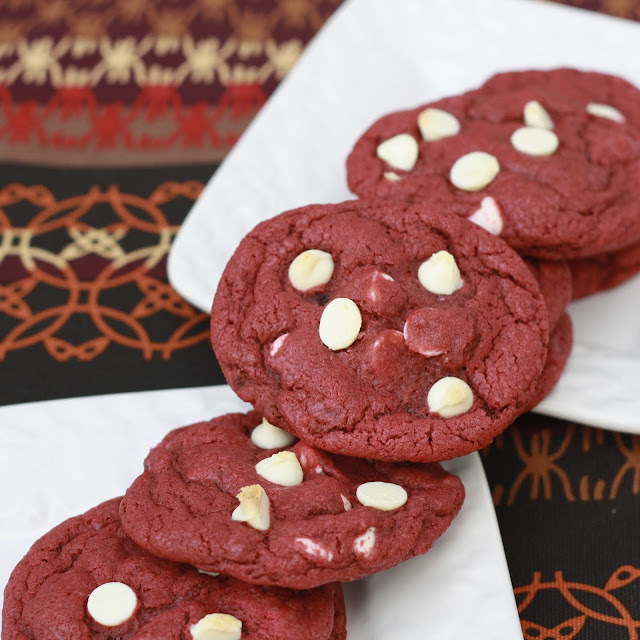 I made these for our friend Greg’s surprise party, knowing he loved red velvet, but since I was already making a cake, I needed to find another way to incorporate copious amounts of red food coloring. 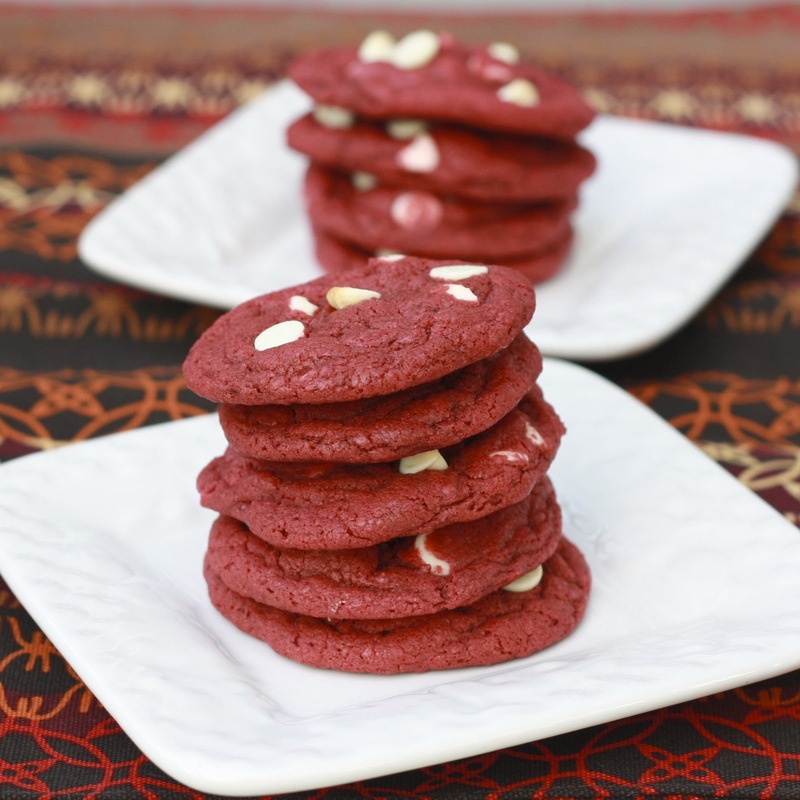 These cookies did it—a deep red color and the perfect chewy texture (and you know how picky I am about this! ), studded with white chocolate chips—no frosting needed! 1. Preheat oven to 375F. In a mixing bowl, whisk together flour, cocoa powder, cornstarch, baking soda, and salt. Set aside. 2. In the bowl of a stand mixer, add butter, shortening, and sugar. Beat on medium speed for 4 minutes, until light and fluffy. Add egg and egg yolk, beating to combine. Add vinegar, vanilla, and food coloring, mixing until well blended. 3. Slowly add dry ingredients to the wet ingredients, mixing just until combined. Mix in 1/2 up white chocolate chips. Scoop heaping tablespoonfuls of dough out and roll into balls. Place on baking sheets lined with parchment paper. Carefully press 4-6 white chocolate chips into the top of each cookie (without flattening the cookies). 4. Bake for 8-9 minutes. Allow cookies to cool on pan for a few minutes before transferring to a wire rack to cool completely. Store cookies in an airtight container.